I’d been looking forward to this evening for a while, two real reasons. Firstly I love the wines and however biased that may be it comes from the fact that this historic estate is making wines as good if not better than ever. Secondly, if there is one thing as good as lovely wine it is drinking it with fun people you really enjoy the company of and that was the case here. Great array of de Vogue a couple of years ago was an additional reason! We then moved to the next course of Squab Pigeon with Cep Purée with a trio of Chambolle’s – Chambolle-Musigny 2007, Chambolle-Musigny 1er Cru 1999 & Chambolle-Musigny 1er Cru Les Amoureuses 2001. This was a great combo because all three had their marked similarities but also pronounced differences, contradictory though that may sound. The pigeon was superb especially when you consider this was 60 people at one time. Chambolle-Musigny 2007 – This is made from a combinations of holdings but two of them are 1er Crus – Les Baudes and Les Fuees – this had a linear nervouness, a real focus, also a light raspberry fruit and some orange rind. A dryish finish, a good if slightly simple wine. I like the vintage for it’s purity and the fact you can drink and enjoy them now, some people don’t thinking it is weak, being lightweight. 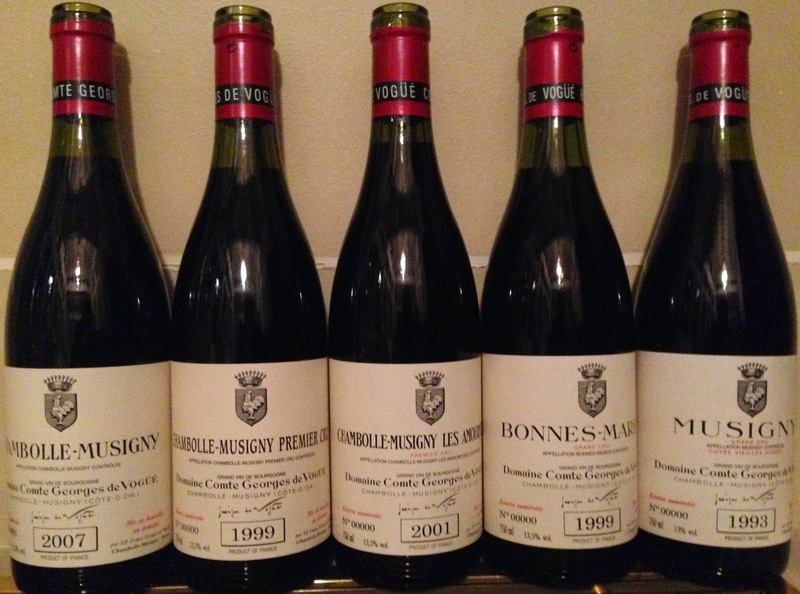 Chambolle-Musigny 1er Cru 1999 – This is all from young vines that could all be released as Musigny, therefore Grand Cru in all but name. The estate has done this since 1995. The wine was much richer than the 2007, more texture, more layers. Black fruit as well as red, a little whiff of truffle too which adds a lovely savoury edge without reducing the sweet fruit. It has half the primary purity characteristics of a 1999 and then a little of the savoury beefiness of 2002. Impressive all round and will certainly continue to repay cellaring. Ready to be enjoyed? Yes, but no rush whatsoever. Impressive. Chambolle-Musigny 1er Cru Les Amoureuses 2001 – The final of the trio and the last non Grand Cru of the evening, a moot point in a way as Amoureuses is in the top two 1er Crus that would be Grand Crus in the Cote de Nuits (by general consensus before you think I am being overly obnoxious). The wine itself was a joy. Femininely defined power and poise, so much to come, lots of prettiness and correctness but no lack of fibre and structure albeit hidden. Jean-Luc described Amoureuses as “the first lady of Chambolle” and romantic though that sounds it is spot on! It was very “2001” by which I mean there is a lightness of touch and a freshness. Where 2001 sits in the trio of 1999, 2001 and 2002 over time we will have to see but my feeling its that like 1991 in Burgundy those that have the balance will be wonderfully rewarding. Smashing wine. It’s such a shame there is so little of it. 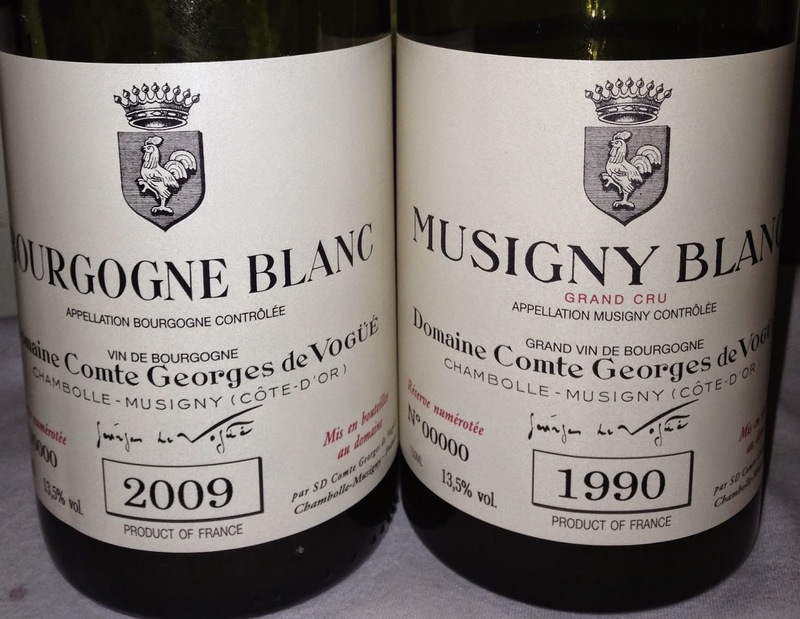 One wine remained – Musigny Blanc Grand Cru 1990 which was served with Cheese. So in many ways we were back to the beginning. The 1990 was as with the 2009, unctuous and nutty on the palate. Two members of the press at the dinner each had a take – “like a Vendages Tardive” was one and “with aged Rioja blended in” was another. The wine was very complex indeed but to me, in honesty, not as good as the 1992 and 1993 that I’ve been privileged to drink.